How do organizations develop the commitment and loyalty from their employees that propel performance beyond normal to extraordinary on a daily basis? What makes one organization an award winner and another scrambling to survive? What in the organization leads employees to do the best they can? In one word: entanglement – a phenomenon in which employee and organizational commitment to each person, system, and component of the organization is so deeply ensnared in the company’s mission, vision, values and goals that sustainable success is the outcome. 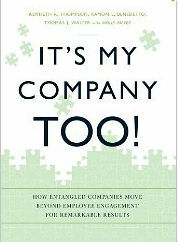 Creating an entangled organization with entangled employees at every level does not happen overnight. What are the specific actions leaders need to take to create unique environments that employees love and protect? What actions do communication professionals need to take to ensure communication efforts result in employee entanglement?